Crock Pot Chicken Cacciatore is a one-pot Italian dinner dish that everyone will enjoy. 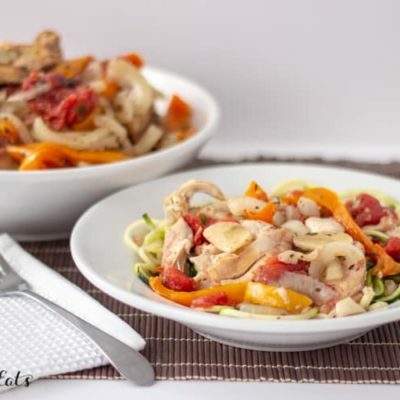 The chicken is tender and juicy, and you have flavorful onions, tomatoes, and peppers in a light sauce. 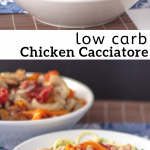 Try my low carb slow cooker chicken cacciatore today. 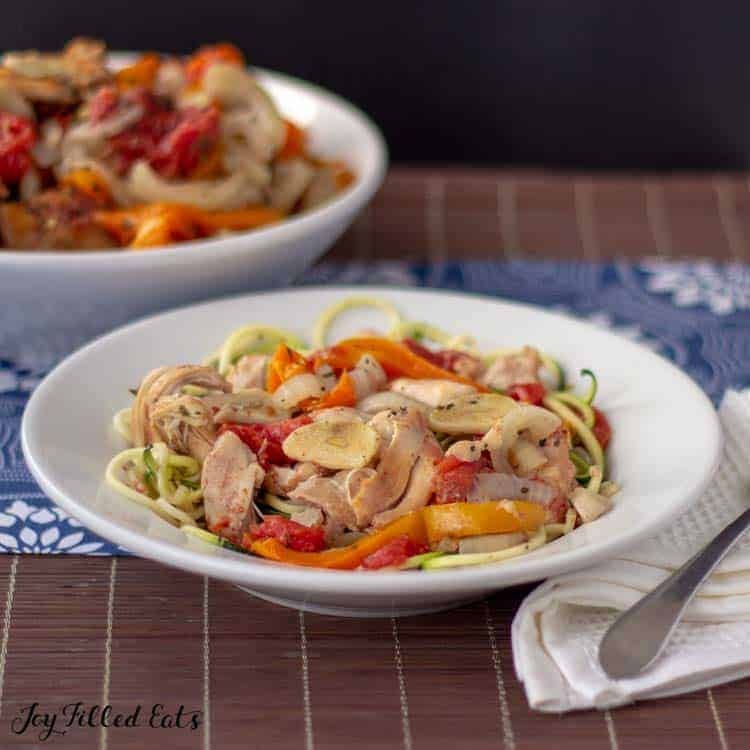 This Crock Pot Chicken Cacciatore recipe is low carb, gluten-free, keto, grain free, dairy-free, paleo, & THM S.
Chicken cacciatore is one flavorful dish that can be served over spiralized zucchini noodles for a hearty and wholesome dinner for family or guests. I love crock pot meals when I don’t feel like cooking. I tend to just toss a bunch of stuff in the crockpot and say a little prayer. Most of the time it works. This Crock Pot Chicken Cacciatore Recipe definitely worked. It was a hit at my house. All I know of Chicken Cacciatore is that it is chicken with tomato sauce and peppers and onions. It usually is bone-in chicken, but I prefer boneless, skinless thighs for crock pot meals. I had some chicken, a pepper, a ton of onions, and a can of tomatoes so this became one of our dinners last week. I served it on top of zucchini noodles. 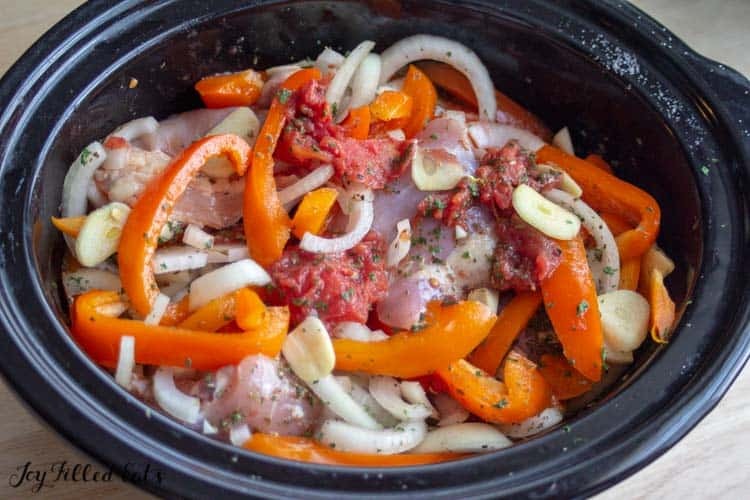 This shouldn’t take more than 5-10 min to prep because all you need to do is slice two onion, one pepper, and some garlic and then just dump everything into the crockpot. Doesn’t this Easy Crock Pot Chicken Cacciatore look good? Chicken Cacciatore can be a mouthful, but ever wonder what does chicken cacciatore mean? “Cacciatore” actually stands for, “hunter.” Meaning you would use items like onions, tomatoes, peppers, and even sometimes carrots and herbs that you hunted to find to make. Traditionally cacciatore is made with either a braised chicken or even rabbit. Place all the ingredients in your crockpot and turn it on low for 6-8 hours. Or if you want your dish done faster, turn on high for 3-4 hours. You want to make sure that your chicken reaches an internal temperature of 160 degrees, which you can use a meat thermometer to check. Then serve with zucchini noodles, spaghetti squash, gnocchi, pasta, or whatever you would like. As you can see this is a very easy and no fuss dinner recipe the whole family can enjoy. 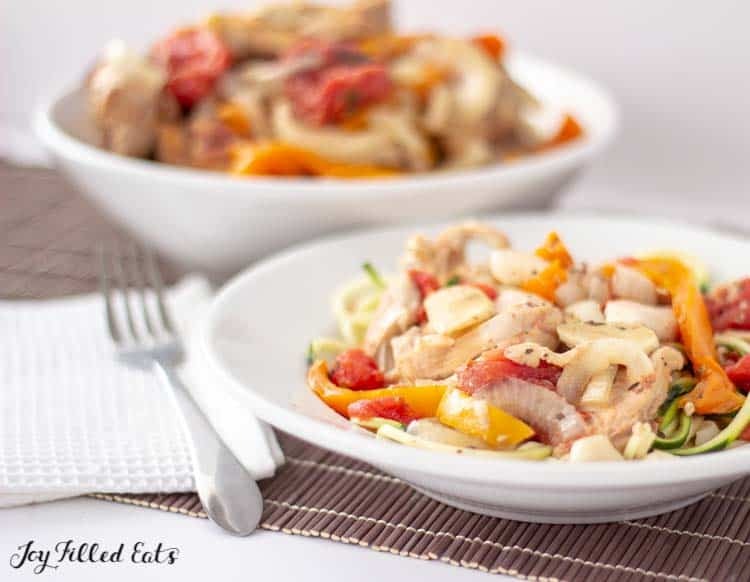 The slow cooker chicken cacciatore is a recipe I make over and over again on those busy nights where I know I don’t want to cook after the long day. With a five minute prep, you have dinner waiting for you when you open that door! 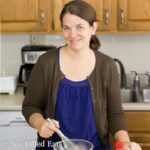 Plus using this recipe to meal prep for quick lunches for the family is a great way to give your family something wholesome, low carb, and a dish that will keep them fueled up until the next meal. A lot of times you will see people serve chicken cacciatore with either a semolina pasta, egg noodles, gnocchi or even rice. For a lighter option, I reach for zucchini noodles. It helps to add in nutrients to the dish without packing on extra carbs. I make my zucchini noodles using this spiralizer. They come out perfect every time, and I like the option to make fat or thin noodles. If you are looking for sides, many pair sauteed spinach or broccoli on the side. You could even reach for cauliflower if you would like. We generally don’t have other sides, since I add in the zucchini noodles. But you are welcome to pair with what sounds the best. Store in the fridge for 3-4 days. Make sure you place in an airtight container. I like to grab single-serve plastic containers and meal prep for the week. Then I can grab and heat a quick lunch or even dinner for myself on busy days. You can freeze chicken cacciatore easily. Place any leftovers in a container that is freezer-friendly, and toss in for up to two months. Then when you want to reheat, just put in a pan on the stove and heat on low. I have found thawing your chicken cacciatore in the refrigerator overnight is helpful when it comes to reheating. Then whip up some zucchini noodles or pasta to serve over the top. 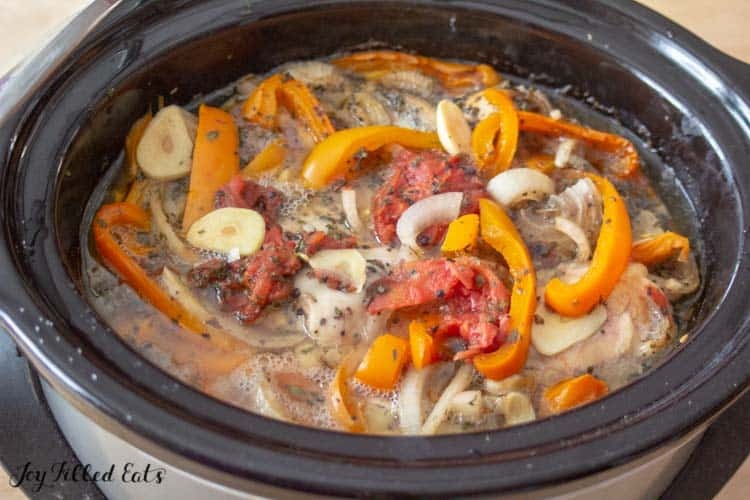 Have you tried Slow Cooker Chicken Cacciatore before? 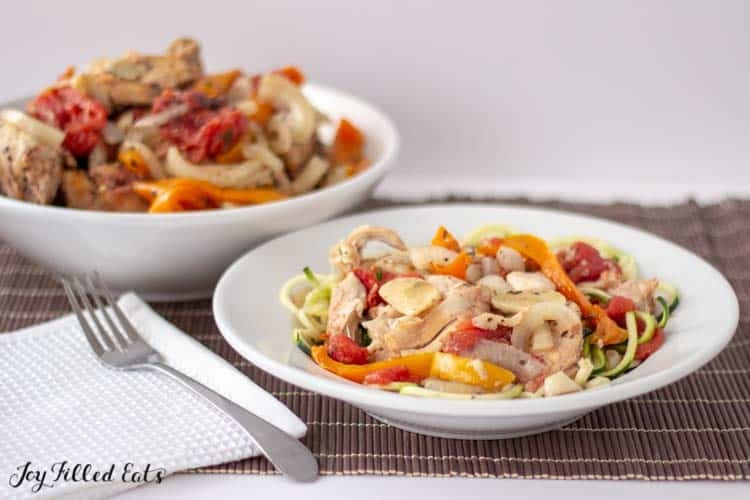 This Slow Cooker Chicken Cacciatore recipe is low carb, gluten-free, keto, grain free, dairy-free, paleo, & THM S. is a one-pot Italian dinner dish that everyone will enjoy. 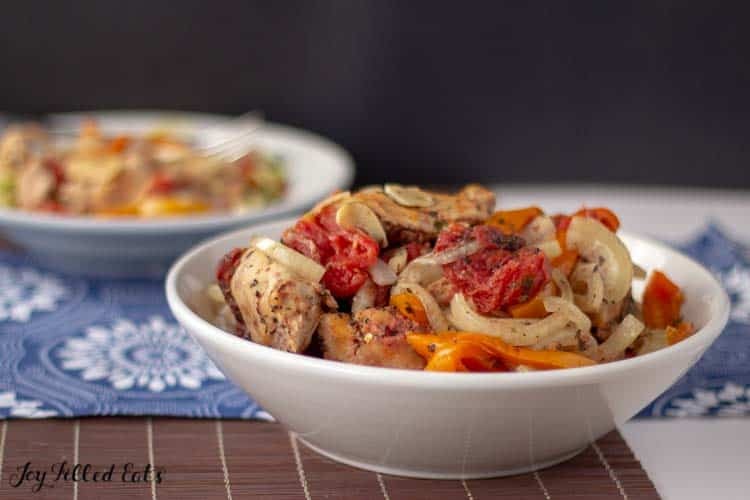 The chicken is tender and juicy, and you have flavorful onions, tomatoes, and peppers in a light sauce. Try my crock pot chicken cacciatore today. 1 large can whole peeled tomatoes approx 28 oz. Put all the ingredients into a crockpot. Cook on low for 6-8 hours or on high for 3-4 hours until the chicken is tender and at least 160 degrees. The chicken should fall apart. Add salt to taste. Serve with zucchini noodles or spaghetti squash. Originally Published March 27, 2016. Revised and Republished March 13, 2019. I love a delicious, simple, crockpot recipe! I love how healthy this is AND it tastes amazing! Went over really well with the kids!